Difference between revisions of "MythWeb"
10.2 Browser says "Not Found"
MythWeb provides a frontend for scheduling and managing recordings on your MythBox from a web browser located on another machine. Provided the security is set up correctly on your MythBox you can access your machine from anywhere on the internet, or even your mobile phone as long as you have a compatible browser. Of course it is just as useful to browse your myth content from your laptop while your partner is watching their favorite programme. Mythweb also has some unique capabilities that are only available through the web interface such as allowing for the change of key bindings and other settings. Indeed, many functions you might want to perform on your MythBox are faster or easier through MythWeb. (How much this is true, of course, depends to some degree on what version you're running). Don't confuse this with MythBrowser which is a web page browser that runs inside of mythtv itself. Once MythWeb is installed, you can simply access MythWeb from any web browser. However, you will not be able to remotely access your MythTV machine until you open the port to your PC. You need to enter your home router and enable port forwarding. You need to manually change some settings in your router that let it know that you want traffic from outside the home network to enter your home network. And you want that outside traffic to be sent directly to 192.168.0.100 (the IP address of the MythTV backend) on port number 80 (which is the default port for the apache HTTP server). Also note that your ISP may block all traffic on port 80 b/c they do not want residential customers to be running HTTP servers. So you may need to change the default port 80 to some other number (ex: 8080). Then don't forget to change your router's settings to forward port the incoming port 8080 to the internal network's port 80. In addition, most users have dynamically assigned IP addresses from their ISP. This means that your ISP can change your WAN IP at any time and if this occurred while your away from your home, you would not know what the new IP address is and therefore you would not be able to access your MythTV PC remotely. The way to prevent this from happening is to use dynamic DNS. Google it. There are many free choices which will allow you to map any changes that your ISP makes to your home IP address. This will allow you to maintain a connection to your home computer regardless if any changes to your IP address were made. Lastly, don't forget that you still need to modify your home computer's configuration to grant your remote computer access. This means that you may need to change a few files. Notably, if you're accessing a linux systems (ubuntu/kubuntu/etc), change these files: /etc/hosts.allow and /etc/hosts.deny. See MythWeb INSTALL for details on how to install, especially on Linux. (Note this is hard linked to the 0.22-fixes version of this document). For installing on Mac OSX, please see MythWeb_on_Mac_OS_X_Backend or MythWeb via MacPorts. Browse your Music Collection and download to your local machine for direct playback. 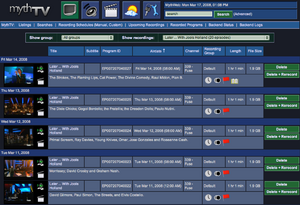 The interface allows you to search and browse the playlists you have set up in MythMusic. You can also put together new playlists in the web interface. The interface also provides buttons that when pressed will stream the music in the playlist over HTTP to your browser (via a .m3u file). Your browser needs to know what to do with the file - e.g. start up a music player. Not all players seem to cope well with the file that is sent; VLC seems to work ok.
Get weather reports as per MythWeather. In 0.27 database logging is disabled by default, and only enabled via the Mythbackend command line. In this case the Server Logs cannot be displayed and an error message is displayed. 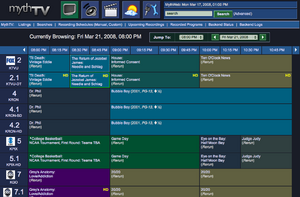 Configure MythWeb and some of the MythTV settings. One contributed favicon is File:Favicon.jpg (it's really a .ico file; see the page). If your web server is accessible from the internet it is important that you secure MythWeb with some kind of authentication. This guide will take you through setting up simple password authentication. Please see the Apache  for more specifics or more secure methods. MythWeb password authentication is configured in the configuration files of the apache2 service and read at runtime rather than with each web-request as with .htaccess; for this reason this is more efficient from a computer resource point of view. For this reason this is the method that is recommended by Apache. There are at least two methods of configuring password authentication within Apache2 config files; Authentication with either the Basic or Digest modules. Basic Authentication sends the submitted username and password in clear-text over the network; Digest uses a more secure method of sending the details encrypted over the network. In both cases the content of the pages sent to the web browser are unencrypted as is typical with non-financial web-pages. The simplest option is to edit /var/www/html/mythweb/.htaccess and read the comments there about what to uncomment to secure MythWeb. This option does not require Apache to be restarted, but is slightly less efficient than adding the options to the Apache config. You may use either AuthType Basic or AuthType Digest -- "Basic" is more compatible, "Digest" is more secure. If you use "Basic", you must use htpasswd to create users. If you use "Digest", you must use htdigest to create users. These steps are for openSUSE 10.2 The instructions are written using "htpasswd2" instead of "htdigest2" because that is what I got to work. I'm sure you could use "htdigest2", I'm just now sure how. These steps should work fine though. In YasT under Network Services->HTTP Server. Under "Main Hosts" select "Directory /srv/www/htdocs "
5. If the .htaccess exists, which it probably does if you have mythweb installed, back it up. This is just in case you mess it up and it need to start over. Save the file and authentication should begin immediately. 8. If you don't want to bother with authentication when you are on the same network, add the following lines and authentication will be bypassed (assuming 192.168.1.0 is your local network). If you aren't sure what your network is, if you are using a router purchased from a store, you could probably get away with specifying "Allow from 192.168.". This would also cover you if you move your box from one location to another using a different third octet in the IP. With this in place, though, you should not be prompted now for authentication while on the local network. UPDATE: I'm not 100% sure that this last step works. I tested from a remote site and was able to access MythWeb without being prompted for a password. The remote site also used the 192.168.1 network range. After removing the last two entries above, it prompted right away. NOTE: I had the same problem with the last step not working, but after a lot of digging it turned out that there were conflicting authentication configurations in the main apache config file and in the sites-enabled/default files. These are the settings which worked for me. You will need to create an htdigest password file -- a suggested location is /etc/httpd/conf, but it should be a location that gets backed up regularly. Please make sure you DO NOT use the -c after the initial user, as this will overwrite the file and start from scratch. The following lines should be present but commented after the initial installation. Make a backup copy of your existing conf file. Afterwards open the file and either remove the "#" (or copy the section before) from the start of each line, modify them to fit your setup, and save the file. It may happen, that you'll get an error because of misconfiguration. Obviously, check if you need to activate the auth_digest module ! This method is slightly more efficient than the .htaccess method, but is complicated by the fact that you must restart Apache and mis-configuring the Apache configuration file will keep Apache from restarting. We will start with creating an Apache password file. I put this in /etc/httpd/conf, as I back up this directory every night to one of my other systems. Modify the password file location and required users per your needs. Again, tailor your password file and users to your needs. You can even use separate password files if you wish! It should also be possible to restrict any individual action on Mythweb using the right regular expression in the LocationMatch. You can do a lot more with these configuration sections, such as secure by ip address, and more. Please see the Apache docs . MythWeb uses the concept of skins to give the user the power to edit/change the look and feel. The skins are based on CSS files that can be customized. To install the skins, extract them to the mythweb/skins/ directory. Once you have verified that the file location/symlink is correct, edit the file and check that the paths inside it are correct. "Not Found - The requested URL /mythweb.php/mythweb/ was not found on this server." then double-check your mythweb.conf configuration file to ensure that the directories are correct. Unable to connect to mythbackend, is it running? Check if your /etc/mythtv/config.xml is valid. Hi - for the archive. Symptom: Mythweb movie artwork does not show. things, so I'm not 100% sure what the matter is. If Streaming Music over Mythweb is not working check to confirm that there is a link to your music directory in mythweb/data. If your music is stored in /mythtv/music and your web directory is /var/www/html/mythweb then you would need to add a link like. Could not create a symlink to /content/dvd, the local MythVideo directory for this hostname (hostname). Please create a symlink to your MythVideo directory at data/video in order to use the video portions of MythWeb. where target file is the location of your video and video_cover folders respectively. If your timezone has daylight saving which moves from year to year, you might experience this problem. This is because PHP does not use the system timezone information but has its own timezone database built in. System timezone information is easily updated (e.g. yum update tzdata) and if your system clock is wrong you probably should. The compiled-in data of PHP is not easily updated and reflects what the developers of PHP thought was correct when it was coded at some time in the past. The times in the MythTV database may be correct even though they show incorrectly in MythWeb. This happened in timezone Australia/Sydney in March/April 2008 when the daylight saving change was moved back by one week - MythWeb times were one hour out for the week and then corrected themselves. To resolve future issues with daylight savings timezones being altered it may be neccessary to update or install the php timezone database. The following process was used successfully to install the php timezonedb with Ubuntu 7.10 (Gutsy). when you open the "Backend Status" page, then you need to enable/install the curl plugin for php. The error should be resolved after a restart of the web server. Alternatively you can enable fopen in your php configuration file, but this is not recommended due to potential security issues with fopen. 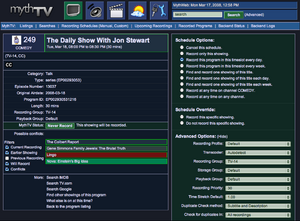 Click the "Settings" button (a picture of a key & wrench), click the "MythWeb" button on the left, click the "MythWeb Defaults" tab, and verify that there is a check in the box for "Show the channel icons"
Run mythtv-setup, select "Channel Editor", select "Icon Download", and then select "Download all icons" from the list. Further information on channel icons is available in the Channel_icons page. Unable to connect to the master backend at 127.0.0.1:6543.
then check the permissions on the mythweb.pl file to make sure that it has execute permissions enabled.